January 11, 2011 (Glendale, CA): ABCmouse.com Early Learning Academy–a pioneering full online curriculum preschool through kindergarten educational website launched publicly in November 2010—recently received the prestigious Editor’s Choice Award from Children’s Technology Review (CTR), a monthly publication that features the latest products and trends in children’s interactive media. CTR’s review process is designed to broadly measure five factors that generally apply to most children’s interactive media experiences: ease of use, educational value, entertainment value, design features, and overall value. Global variables strongly influence the ratings in each of these factors, especially “smart” features (like the ability to adapt to a child’s capabilities or to expand in complexity), respecting a child’s time (for example, by making it easy to save work or progress), and so on. On a scale of 1 to 5, ABCmouse.com received 4.5 stars. Buckleitner, a former preschool and elementary school teacher, founded CTR in 1993 after spending 10 years at the HighScope Educational Research Foundation. He has been an adviser to Consumer Reports WebWatch as well as a judge for the Association of Educational Publishers’ Golden Lamp awards and has taught at Michigan State, along with New York University’s Interactive Telecommunications Program and the Rutgers Graduate School of Education. In addition to serving as editor of CTR, Buckleitner writes for Parents magazine and Scholastic Parent & Child magazine, among other publications. ABCmouse.com Early Learning Academy provides parents and teachers with a safe, engaging online environment where young children can learn their ABC’s using a computer mouse, thus the name, ABCmouse.com. The goal of this new and unique learning experience is to help children build a strong foundation for future academic success by providing engaging educational content that supplements and supports preschool, pre-k, and kindergarten programs in the subject areas of reading, mathematics, social studies, beginning science, art, and music. The site’s comprehensive curriculum, developed in collaboration with nationally recognized early childhood education experts, offers a depth and breadth of educational content for early learners never before seen in one location on the web. From ABC’s and 123’s to Thank You and Please, ABCmouse.com is “Bringing Learning to Life®” by offering more than 2,000 individual learning activities—online books, games, songs, puzzles, art activities, and printables—contained within more than 350 custom lesson plans spanning six academic levels. ABCmouse.com recently announced the release of a new collection of highly innovative educational apps for the iPad, iPhone, and iPod touch, with engaging features to enhance early learning. These apps, which introduce three of ABCmouse.com’s new children’s books series beginning with six beautifully illustrated interactive books as well as an interactive zoo environment, are the first of ABCmouse.com’s ongoing series of releases of educational apps for young learners, extending its online curriculum to the mobile platform and providing opportunities for children to learn from ABCmouse.com no matter where they are. Direct links to these apps are provided below. 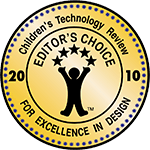 Doug Dohring, Founder and CEO of Age of Learning, Inc., which owns and operates ABCmouse.com commented, ”We’re very pleased to receive the Children’s Technology Review Editor’s Choice Award because it recognizes that ABCmouse.com is an extremely rich resource for parents and educators that goes well beyond educational games and interactive children’s books. ABCmouse.com Early Learning Academy is a global education initiative of Age of Learning, Inc., whose goal is to help children build a strong foundation for future academic success by providing a comprehensive and engaging online curriculum to greatly assist early learners to succeed in pre-k, kindergarten, and early elementary school programs. The site is named ABCmouse.com because it’s a place where children can learn important educational basics (often referred to as “the ABC’s”) through the use of a computer mouse, thus ABCmouse.com. At ABCmouse.com, the computer mouse comes to life as ABC Mouse, who serves as the site ambassador and guide to early learners everywhere.